Asbestos is officially classified as a hazardous material in California because inhaling tiny asbestos fibers can cause serious health conditions including lung cancer, mesothelioma, and asbestosis. In general, asbestos-containing materials are not dangerous unless they are damaged, because asbestos fibers can’t escape from intact materials. If you have damaged asbestos-containing materials on your property, don’t touch them. Instead, call in the pros from AQHI Inc. to handle your asbestos removal West Hollywood CA quickly and safely. Do You Need Asbestos Removal West Hollywood CA? Over time, these materials can break down, releasing dangerous asbestos fibers that can be inhaled and cause serious health problems. 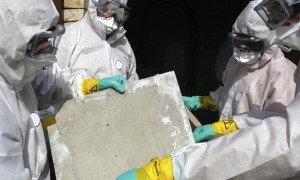 The best way to eliminate the risk is through professional asbestos removal West Hollywood CA. It is especially important to remove any asbestos-containing materials that may be located near your HVAC ducts and vents. If asbestos dust gets into your HVAC system, it can easily spread to areas far removed from the original source of the contamination. Fortunately, you can count on AQHI to perform a fast and thorough asbestos duct removal West Hollywood CA to eliminate this hazard. Our asbestos removal office for West Hollywood CA is open Monday through Friday between 8:00 AM and 5:00 PM and closed for lunch from noon to 1:00 PM. With advance notice, projects can be scheduled for weekends, early mornings and evenings.